I've made two cards for today, each stamping with distress ink on an acrylic block and adding water. Jennifer McGuire also showed this technique to create focal points for a card, and white or black heat embossing on top. I decided to use this same technique to create a pattern on the background of a card. One card uses this technique with overlapping the watercolor pattern to create a more organic background, and the other uses it with one square right next to one another to almost create a watercolor quilt in the background. Let's get started! For my first card, I used a larger rectangular acrylic block. I added Grape Preserves, Salty Ocean and Peacock Feathers distress inks to the block and sprayed generously with water. I first stamped the acrylic block directly in the middle of the card panel. Then I started stamping the block around it, overlapping sometimes horizontally and sometimes vertically. I also let the excess watercolor expand out and create some organic shapes on the card. This creates a background with a nice mix of straight lines and organic lines, and gives a more ethereal background. For my second card, I used a small square acrylic block and using the same colors as before, stamped repeatedly next to each other to create a grid-like background. This time, I did my best to make sure the color stayed within each individual square, sometimes using a paper towel to mop up excess color. I then took the edge of the acrylic block and applied Peacock Feathers with some water in between some of the squares to create a more defined edge and add some more variation in color. This creates a sort of watercolor-quilt effect. To bring these cards together, I die cut a stitched rectangle from Lawn Fawn from white card stock to help break up the background and give the card a better focal point. 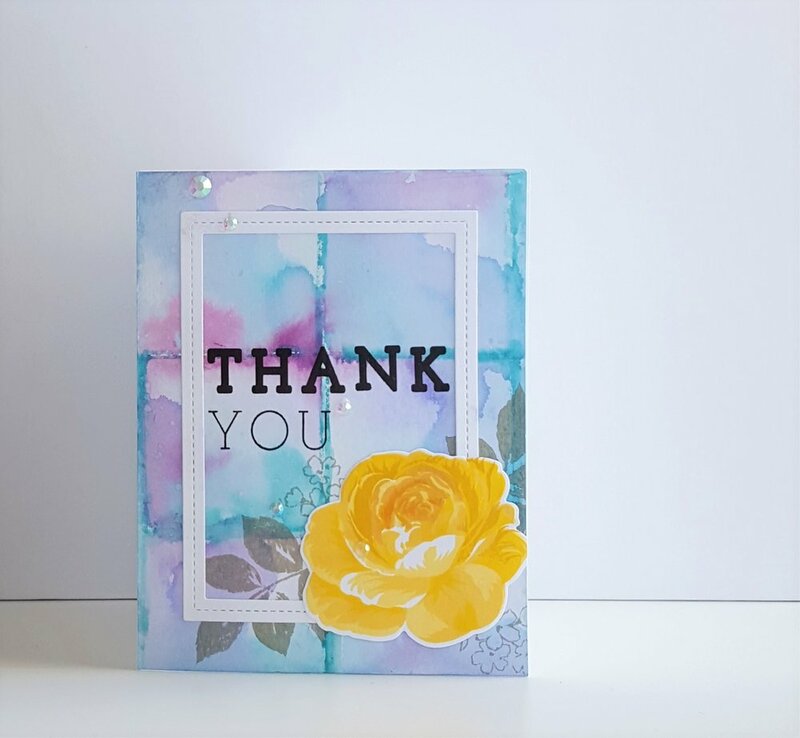 I then stamped and die cut this Altenew Build-a-Flower rose in yellow inks, as a nice contrast to the purple-y blue background. Without adhering it yet, I placed in the bottom right corner where I wanted it, and used it as a guide to help stamp the leaves in gray ink so they would emerge from the flower. Once I had the leaves and small flowers stamped, I adhered the white frame to the center of the card, and adhered the rose on top of that. Then using black ink, I stamped a sentiment near the rose to help make sure the focal point stayed near the rose and let the watercolor background have more uninterrupted space. For finishing touches, I sprayed a few times with Shimmer Ink Spray and added a few gems from Lucy's cards. That's it for these happy cards! I hope you enjoyed this and try this technique of creating patterns yourself! There's so many possibilities!